SECOND STRING MUSIC received the new Gretsch order Wednesday. I'm always like the kid in the candy store when new guitars arrive. We also got ukuleles and mandolins from Gretsch. You have to see these instruments to appreciate them. We got even more guitars and ukes in this morning. Speaking of seeing, we get a lot of people who come in and say "Just looking" when asked if we can help them. That's fine. We understand renting a band instrument or buying a guitar is not a spur of the moment thing, though we encourage that, too. And coming in for picks or cables or tuners - the small stuff - is just as important. 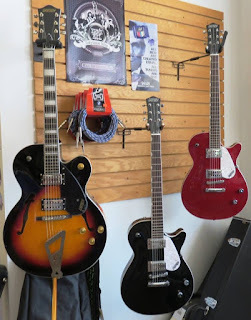 Yesterday a young man came in just after the Gretsch order arrived. When he said "Just looking," Sheryl politely said, "Well, if this was an ice cream shop, what flavor would you be looking for?" The young man got it, and we pointed him over to our ever-expanding selection of acoustic guitars, where he happily plucked away for a few minutes. He complimented us on the store and said, "It must be nice to just play all the guitars all the time." Well ... sure. Not all the time. And me more than Sheryl, which is why this whole retail music store thing is still alive after five-plus years. We have all kinds of flavors here - Gretsch, Breedlove, Takamine, Dean, Ibanez, Luna and more. Come on in and lick on them all!